To evaluate the safety, immune responses, and antitumor responses after the administration of α-galactosylceramide (αGalCer) KRN7000-pulsed PBMC cultured with IL-2 and GM-CSF (IL-2/GM-CSF-cultured PBMCs), a phase I-II study in patients with non-small cell lung cancer was conducted. Patients with advanced non-small cell lung cancer or recurrent lung cancer refractory to the standard therapy were eligible. αGalCer-pulsed IL-2/GM-CSF-cultured PBMCs (1 × 109/m2) were i.v. administered four times. Immune responses were monitored weekly. Twenty-three patients were enrolled in this study and 17 cases (73.9%) completed. No severe adverse event related to the treatment was observed. After the injection of αGalCer-pulsed IL-2/GM-CSF-cultured PBMCs, an increased number of IFN-γ-producing cells in the peripheral blood were detected in 10 patients (58.8%). Five cases remained as stable disease, and the remaining 12 cases were evaluated as progressive disease. The estimated median survival time (MST) of the 17 cases was 18.6 mo (range, 3.8 to 36.3 mo). Ten patients who displayed increased IFN-γ-producing cells (≥2-fold) showed prolonged MST (31.9 mo; range, 14.5 to 36.3 mo) as compared with poor-responder patients (n = 7) MST (9.7 mo; range, 3.8 to 25.0 mo) (log-rank test, p = 0.0015). The administration of αGalCer-pulsed IL-2/GM-CSF-cultured PBMCs was well tolerated and was accompanied by the successful induction of NKT cell-dependent immune responses. The increased IFN-γ-producing cells that result from αGalCer stimulation in PBMCs were significantly associated with prolonged MST. These results are encouraging and warrant further evaluation for survival benefit of this immunotherapy. Studies show NKT cells, a unique lymphocyte subpopulation, are characterized by the coexpression of an invariant Ag receptor and NK receptors (1, 2, 3). Murine and human NKT cells are activated by a specific glycolipid Ag, α-galactosylceramide (αGalCer),3 in a CD1d-dependent manner (4, 5, 6, 7). After activation, human Vα24 NKT cells exhibit MHC-independent antitumor activity against tumor cells in vitro and in vivo through several mechanisms (8, 9, 10, 11, 12). Activated Vα24 NKT cells produce a high level of cytokines, such as IFN-γ, thereby bridging innate and adaptive immunity through the activation of other effector cells including dendritic cells (DC), NK cells, and CD8+ T cells (13, 14, 15, 16, 17). From a therapeutic point of view, αGalCer-pulsed DCs activate Vα14 NKT cells leading to the eradication of established metastatic tumor foci in a mouse model of liver and lung metastasis (18). The i.v. injection of αGalCer-pulsed DC induces the activation and the expansion of endogenous Vα14 NKT cells in the lung parenchyma (19, 20). Thus, similar antitumor effects in the lung may be expected when αGalCer-pulsed DC are administered into human. Non-small cell lung cancer (NSCLC) represents more than 80% of all lung cancer cases, and the majority of patients are classified with locally advanced stage III and metastatic stage IV disease. Platinum-based chemotherapy is a standard for the first-line treatment of advanced NSCLC (21). Refractory or relapsed cases after the first-line therapy are considered to be far more difficult to treat (22, 23, 24). The patients with late-stage NSCLC are often symptomatic and a standard chemotherapy frequently causes the unfavorable complications, and thus, the establishment of a novel therapy with low-toxicity, such as immunotherapy, is highly desirable. Recently, whole PBMC cultured with IL-2 and GM-CSF (IL-2/GM-CSF-cultured PBMCs) and pulsed with αGalCer were tested in a phase I clinical study in 11 patients with advanced or recurrent NSCLC refractory to standard treatment (25). This cell therapy was shown to be safe (only grade I or II toxicity was observed) and showed evident immune responses in all three cases treated at the maximum dose. Although there was no obvious clinical response, two patients experienced stable disease for 14 and 13 mo and all three maximum dose cases exhibited long overall survival for 33.9, 59.8, and 16.7 mo (unpublished observations). Consequently, we extended our study and performed a phase I-II study of αGalCer-pulsed IL-2/GM-CSF-cultured PBMC administration in patients with advanced NSCLC to evaluate the safety, immunological responses, and clinical outcomes. For the 17 patients who completed the study, the treatment was well tolerated and NKT cell-dependent immune responses were elicited. The results indicate a correlation between the increased IFN-γ production upon αGalCer stimulation and prolonged median survival time (MST). Patients age 20 years or older with histologically or cytologically confirmed unresectable or recurrent NSCLC who received chemotherapy, radiotherapy, or both for at least 4 wk before enrollment were eligible for the study. Additional inclusion criteria included performance status of 0, 1, or 2; life expectancy of at least 6 mo; normal or near normal renal, hepatic, and hematopoietic function (white blood cell count >3000/μl, platelets >75,000/μl, serum creatinine <1.5 mg/dL, total bilirubin <1.5 mg/dL, and serum aspartate aminotransferase <2.5 times the upper limit of normal, serum alanine aminotransferase <2.5 times the upper limit of normal). Vα24+Vβ11+ NKT cells were detected at a level of more than 10 cells in 1 ml of peripheral blood by flow cytometry. Patients were excluded if they had a positive response to HIV, hepatitis C virus, or human T cell leukemia virus Abs or were positive for hepatitis B surface Ag, active inflammatory disease, active autoimmune disease, a history of hepatitis, pregnancy or lactation, concurrent corticosteroid therapy, other active malignancies. Histologic type and TNM classification were classified according to the general rules for clinical and pathological recording of lung cancer described by the Japan Lung Cancer Society. The study was conducted in the Department of Thoracic Surgery, Chiba University Hospital (Chiba, Japan), according to the standards of Good Clinical Practice for Trials on Medicinal Products in Japan. The protocol and related documents were reviewed and approved by the Institutional Ethics Committee (No. 311). Additionally, this trial underwent ad hoc reviews by the Chiba University Quality Assurance Committee on Cell Therapy. The study was conducted in accordance with the Declaration of Helsinki. Written informed consent was obtained from all of the patients before undergoing a screening evaluation to determine eligibility. A scheme of the study design is shown (see Fig. 1⇓). Patients received a total of four i.v. injections of αGalCer-pulsed IL-2/GM-CSF-cultured PBMCs. Before study entry, all patients were assessed by past history, physical examination, and laboratory data including complete blood cell count and blood chemistry. Physical examination and laboratory data assessments were conducted at least once a week. Adverse events and changes in laboratory values were graded according to the National Cancer Institute Common Terminology Criteria for Adverse Event (CTCAE version 3.0). For immunomonitoring, PBMC samples were obtained from patients twice before αGalCer-pulsed IL-2/GM-CSF-cultured PBMC administration, and weekly until 4 wk after the final injection. PBMCs were frozen in Cell Banker2 (Juji Field) in liquid nitrogen until used. All procedures were performed according to Good Manufacturing Practice standards. Eligible patients underwent peripheral blood leukapheresis (Spectra; COBE), and PBMCs were separated by density gradient centrifugation (OptiPrep; Axis-Shield). Thereafter, whole PBMCs were cultured with GM-CSF and IL-2, as previously described (25, 26). Briefly, PBMCs were washed three times and resuspended in AIM-V (Invitrogen) with 800 U/ml of human GM-CSF (GeneTech) and 100 JRU/ml of recombinant human IL-2 (Imunace). The whole cultured cells were pulsed with 100 ng/ml specific ligand, αGalCer (KRN7000, GMP grade; Kirin Brewery) on the day before administration. After 7 or 14 days of cultivation, the cells were harvested, washed three times, and resuspended in 100 ml of 2.5% albumin in saline. IL-2/GM-CSF-cultured PBMCs (1 × 109 cells/m2/injection) were i.v. administered four times (Fig. 1⇑). The criteria for αGalCer-pulsed IL-2/GM-CSF-cultured PBMC administration included a negative bacterial culture 48 h before injection, cell viability >70%, and an endotoxin test 48 h before cell injection with a result <0.7 EU/ml. The average viability of all cultured cells was 90.6 ± 5.4% (range, 82.0 to 96.2%). The surface phenotypes of PBMCs and IL-2/GM-CSF-cultured PBMCs were determined by a FACSCaliber (BD Biosciences) and analyzed using FlowJo software (Tree Star). The mAbs used were: FITC-labeled anti-HLA-DR, CD83, CD14, CD3, CD19 (BD Biosciences), anti-TCR Vα24 mAb (C15, Immunotech); PE-labeled anti-CD11c, CD86, CD56, CD8 (BD Biosciences), anti-TCR Vβ11 mAb (C21, Immunotech); and allophycocyanin-labeled anti-CD11c, CD40, CD3 and CD4 (BD Biosciences). Isotype-matched control mAbs were used as negative controls. CD1d expression was analyzed using mouse anti-human CD1d (NOR3.2) Ab (Abcam) and mouse IgG1 isotype control (BD Biosciences), followed by secondary Ab, FITC-conjugated goat anti-mouse IgG Ab (DakoCytomation). CD4 and CD8 subsets of peripheral blood NKT cells were assessed based on the expression of CD4 or CD8 on Vα24+ cells. PE-labeled αGalCer-loaded CD1d tetramer was prepared in our laboratory according to the method previously described (27). The absolute number of NKT cells and NK cells was calculated using automated full blood cell counts and hemograms. The percentage of HLA-DR+, CD11c+, CD86+, CD40+, CD83+, CD1d+, and CD14+ on the IL-2/GM-CSF-cultured PBMCs were calculated using the overtone subtraction method in FlowJo population comparison platform. The PBMCs were thawed and washed, resuspended in complete medium (RPMI 1640 containing 10% FBS; Invitrogen Life Technologies), and incubated at 37°C in 5% CO2 for 6 h without any stimulation. For detecting IFN-γ-secreting cells, 96-well filtration plates (BD Biosciences) were coated overnight at 4°C with 5 μg/ml human anti-human IFN-γ (BD Biosciences), according to the manufacturer’s instruction. Cells were then resuspended (5 × 105/well) and stimulated with αGalCer (100 ng/ml) for 16 h in 10% FCS containing RPMI 1640. PMA (10 ng/ml) plus ionomycin (1 μM) was used as a positive control. After cultivation, the plates were washed and incubated with biotinylated anti-IFN-γ (2 μg/ml; BD Biosciences). The color development was performed using the AEC Substrate Reagent set (BD Biosciences). Spot-forming cells were quantified by a microscopy. For the detection of IFN-γ production, cryopreserved PBMCs were thawed and cultured for 16 h with or without 100 ng/ml αGalCer. Stimulation with PMA (10 ng/ml) and ionomycin (1 μM) was used as a positive control. Monensin was added 1 h after the beginning of culture (GolgiStop; BD Pharmingen) to allow for the accumulation of intracellular cytokines. Cells were harvested and initially stained for extracellular CD3 and CD56, then were fixed and permeabilized for staining with anti-IFN-γ FITC (BD Biosciences). The number of IFN-γ-producing cells was quantified by flow cytometry. All patients underwent an assessment of tumor status by chest computed tomography at baseline and 4 wk after the fourth αGalCer-pulsed IL-2/GM-CSF-cultured PBMC administration (12 wk after study entry). Patients were assigned a response category according to the Response Evaluation Criteria in Solid Tumors (RECIST) guideline (28). Progressive disease was defined as at least a 20% increase in the sum of the longest diameter of the target lesions or the appearance of new lesions. Partial response was defined as at least a 30% decrease in the sum of the longest diameter of the target lesion. Stable disease was defined as insufficient shrinkage to the levels categorized as partial response or insufficient increase for progressive disease. Overall survival was evaluated from the day 0 (the date of the first leukapheresis). Kaplan-Meier curves were described, and the overall survival was evaluated using a log-rank test. Significance was set at p < 0.05. In accordance with the protocol, a total of 23 patients were enrolled in the study from February 2004 to August 2006. Five patients were withdrawn because their primary disease became worse during the treatment and another treatment was prescribed. One patient withdrew voluntarily from the trial for personal reasons. Profiles of 17 patients who completed the trial are summarized in Table I⇓. Four patients were stage IIIB primary lung cancer, four were stage IV, and nine were recurrent lung cancer after surgical treatment. The study included 14 patients with adenocarcinoma, and 3 patients with squamous cell carcinoma. All patients had received various courses of chemotherapy (Fig. 1⇑). The surface phenotype of the IL-2/GM-CSF-cultured PBMCs prepared for each administration was analyzed by flow cytometry. Representative profiles of one patient (case 003) are shown in Fig. 2⇓A. The percentage of HLA-DR+, CD11c+, CD86+, CD40+, CD83+, CD1d+, and CD14+ cells was determined by the overtone subtraction test using the population comparison platform in the FlowJo software package, and the results were summarized in Table II⇓. The proportion of CD3+ T cells, CD56+CD3− NK cells, CD19+CD3−CD56− B cells, and Vα24+Vβ11+ NKT cells in the cultured cells is also shown. More than 70% of the IL-2/GM-CSF-cultured PBMCs were HLA-DR+ cells, 20–70% were CD11c+ cells, and 50–80% were CD86+ cells. It is known that not only DC but also other remaining cells in the IL-2/GM-CSF-cultured cells showed substantial stimulatory activity on fresh Vα24+ NKT cells as previously described (26). There were some variations in the expression of CD40 (2.8–28.9%), CD83 (19.2–33.1%), and CD1d (2.0–39.1%) (Table II⇓). The percentage of CD14+ cells was very low (mean, 0.97%). To further characterize the IL-2/GM-CSF-cultured PBMCs, they were also analyzed by multiparameter flow cytometry analysis, and representative profiles (case 003) are shown in Fig. 2⇑B. Both CD3+ T cells and CD3− cells express various levels but considerable levels of HLA-DR, CD11c, and CD86 as reported previously (29). The results by the multiparameter flow cytometry analysis of the IL-2/GM-CSF-cultured PBMCs are summarized in Table III⇓. A substantial number of CD3+ T cells and CD3− cells in the IL-2/GM-CSF-cultured PBMCs expressed HLA-DR, CD11c, and CD86. The adverse events during the study course are documented in Table I⇑. One patient (case 018) experienced the recurrence of deep vein thrombosis (DVT) on day 28 and needed to receive continuous injection of heparin (grade III). This patient developed left femoral vein thrombosis 8 mo before the study enrollment, and warfarin potassium was prescribed. According to the course of international normalized ratio, the dose of prescribed warfarin appeared to be insufficient, and thereby the recurrence of DVT occurred (an interpretation by the Chiba University Quality Assurance Committee on Cell Therapy). Thus, no clear relationship between the cell therapy and DVT was established. No major (above grade II) toxicity or severe side effects were observed in other patients. One patient who already had a mild anemia before the trial (case 002) experienced gradual worsening of anemia (grade II). Five patients experienced increased fever (four patients at grade II and four at grade I) a few hours after the cultured cell administration. Bloody sputum appeared on day 49 with the exacerbation of central airway lesion (case 024). Regarding the abnormality of laboratory findings, all data were within the criteria of grade I, and no cases needed an additional treatment. Immunological assays were performed for 17 patients who completed the course of four αGalCer-pulsed IL-2/GM-CSF-cultured PBMC injections. The frequency of peripheral blood Vα24+Vβ11+ NKT cells and CD3−CD56+ NK cells was measured by flow cytometry analysis. As shown in Fig. 3⇓, six patients (cases 002, 004, 005, 013, 017, 018) showed a dramatic increase (2-fold or greater) in the circulating NKT cell number after the first (cases 002, 004, and 018), second (cases 013 and 017), and third (case 005) αGalCer-pulsed IL-2/GM-CSF-cultured PBMC administration. In the remaining 11 cases, no obvious increase was found in the number of circulating NKT cells after αGalCer-pulsed IL-2/GM-CSF-cultured PBMC administration. High values of baseline NKT cell number did not always correlate with the augmentation of peripheral blood NKT cell number after αGalCer-pulsed IL-2/GM-CSF-cultured PBMC injection (Table IV⇓, cases 010, 012, and 019). The absolute number of Vα24 NKT cells increased at various ranges, i.e., up to 21.1-fold (Table IV⇓). In three cases that showed expanded NKT cell number (cases 004, 013, and 018), the cell surface phenotype (CD4 and CD8) of NKT cells was analyzed by flow cytometry. The percentages of CD8+ NKT cells were increased in one case (case 004) but not in other cases. The percentages of CD4+ NKT cells were decreased in (Table V⇓, cases 004, 013, and 018). Thus, although the sample number was quite small, the proportion of CD4+ NKT cells appears to be reduced after stimulation with αGalCer-pulsed IL-2/GM-CSF-cultured PBMCs in vivo. To further confirm the increase in the number of NKT cells, flow cytometry analyses with αGalCer/CD1d tetramer were performed (Fig. 4⇓). Because a recent study showed that αGalCer/CD1d tetramers recognize also Vα24− Vβ11+ non-invariant TCR bearing cells (30), we performed a dual-color staining of Vα24 and αGalCer/CD1d tetramer. We included samples on the days in which an increased number of NKT cells were detected (case 004, day 14; case 013, day 21, and case 018, day 14). The increased number of both Vα24+Vβ11+ NKT cells and Vα24+αGalCer/CD1d tetramer-positive NKT cells were detected on day 14 (case 004), on day 21 (case 013), and on day 14 (case 018). The kinetics of increase in the number of Vα24+Vβ11+ cells and Vα24+αGalCer/CD1d tetramer-positive cells were similar. Concurrently, we assessed the number of IFN-γ-producing cells in PBMCs after restimulation with αGalCer in vitro (Fig. 5⇓). The stored PBMCs were thawed and then stimulated with αGalCer for 16 h in vitro, and the number of IFN-γ-producing cells in the culture were assessed by an ELISPOT assay. In 10 patients, the number of cells with IFN-γ production increased more than 2-fold after the administration of αGalCer-pulsed IL-2/GM-CSF-cultured PBMCs (good responders) as shown in Table IV⇑. In the remaining seven patients, a minimal alteration (<2.0) of IFN-γ-producing capacity was observed (poor responders). To address the contribution of NK cells in the IFN-γ production in response to αGalCer stimulation, we performed IFN-γ intracellular staining of the PBMCs in four cases (cases 004, 005, 023, and 025). The percentages of IFN-γ-producing cells among CD56+CD3− (NK), CD3+CD56+ (NKT), and CD3−CD56− cell populations are shown in Table VI⇓. Although the number of samples was small (n = 5), the results suggest that the IFN-γ production in the patient PBMCs in the ELISPOT system is due to both CD56+CD3− NK cells and CD3+CD56+ NKT cells but not to CD3−CD56− cells. We also observed increased IFN-γ-producing cells (>2-fold) in the ELISPOT assay even without αGalCer stimulation in 10 cases among 17 cases (data not shown). This observation may reflect the activation of NK cells. There were 17 cases evaluated at the end of the clinical trial (day 84). From chest computed tomography findings, there were 5 cases of stable disease and 12 of progressive disease. All patients were followed up for 3.8–36.3 mo after the clinical trial period to elucidate the prognosis and the cause of death. An MST of all 17 cases was 18.6 mo, and 2-year survival rate was 41.2% (Fig. 6⇓A). The clinical outcome, including antitumor effects and time to progression is summarized in Table IV⇑. We sought to find any correlation between the clinical outcome and immune responses after the αGalCer-pulsed IL-2/GM-CSF-cultured PBMC treatment. Among 10 cases in which PBMCs showed an increased number of IFN-γ-producing cells after treatment (>2-fold), four cases (40%) were classified in the category of stable disease. In contrast, among the seven cases with no obvious increase in IFN-γ-producing cells (<2-fold), only one case (14.3%) showed stable disease at the end of the study period (Table IV⇑). Moreover, the former group in which PBMCs showed an increased number of IFN-γ-producing cells (10 cases) showed a longer MST (31.9 mo; range, 14.5 to 36.3 mo) than that of the latter group (MST 9.7 mo; range, 3.8 to 25.0 mo; p = 0.0015) (Fig. 6⇓B). Two-year survival rate of each group was calculated (good, 60.0%; poor, 14.3%). No obvious difference in patient profiles was noted in these two groups (Table VII⇓). In addition, IFN-γ-producing ability of the good responder group was not significantly higher than that of the poor responder group (mean spot number of good and poor responder groups before treatment was 47 spots (n = 10 patients) and 36 spots (n = 7 patients) (p = 0.6378, unpaired t test). Neither baseline NKT cell number nor the extent of NKT cell expansion appeared to correlate with the outcome of clinical responses (data not shown). These results indicate that the increased number of IFN-γ-producing cells upon αGalCer stimulation is correlated with the prolonged survival. One of the aims of the study was to confirm the safety profile of αGalCer-pulsed IL-2/GM-CSF-cultured PBMCs in patients with advanced and recurrent NSCLC. DVT occurred in one patient who had a past history of DVT. Although the unscheduled hospitalization to receive the continuous anticoagulant therapy was needed, the patient recovered to the pre-enrolled status within 2 wk. This event was concluded to be unrelated to the current cell therapy because the control of anticoagulant medication appeared to be insufficient to prevent the recurrence of DVT. Thus, taken together with the results in a previous report (25), we concluded that the current procedure of the administration of αGalCer-pulsed IL-2/GM-CSF-cultured PBMCs is acceptable in terms of the toxicity and safety. We detected obvious increases in the number of IFN-γ-producing cells in PBMCs in 10 of 17 patients who received αGalCer-pulsed IL-2/GM-CSF-cultured PBMCs (Fig. 5⇑). In this assay system, the IFN-γ-producing cells induced after in vitro αGalCer restimulation are NK and NKT cells (31, 32). Most interestingly, good responders in the number of IFN-γ-producing cells (10 cases) showed a significantly prolonged overall survival (Fig. 6⇑). 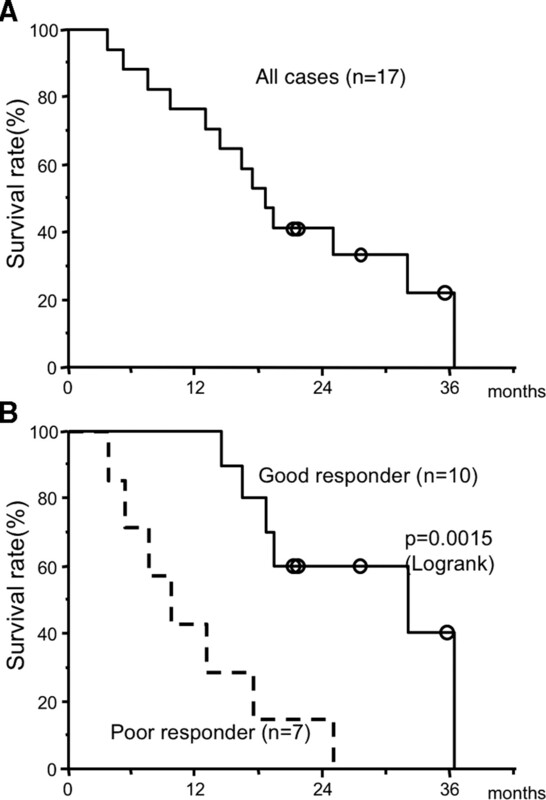 The good responders showed MST of 31.9 mo and the 2-year survival rate of 60.0%. It could be argued that the ability to induce increased IFN-γ-producing cells reflected simply the patients’ original immune status unrelated to the cell therapy, and the failure to induce IFN-γ-producing cells was due to a rapid disease progression, which could explain the early death of nonresponding patients. However, the prolonged survival may be the consequence of the treatment with αGalCer-pulsed IL-2/GM-CSF-cultured PBMCs because of the following reasons. First, IFN-γ-producing ability of the good responder group was not significantly higher than that of the poor responder (mean spot number of good and poor responder group before treatment was 47 spots (n = 10 patients) and 36 spots (n = 7 patients) (p = 0.6378, unpaired t test). Second, MST of all 17 patients seems to be superior to that of advanced lung cancer patients treated with various types of chemotherapy or radiotherapy in the literature. The prognosis of advanced lung cancer patients is generally very poor (33, 34), and large samples of phase III trials with second-line chemotherapy were reported to be associated with MST of 8–10 mo and a 1-year survival rate of 30–35% (22, 24). This MST value is much shorter than the MST of our 17 patients (18.6 mo), and is rather equivalent to the MST of our 7 poor responding patients (9.7 mo). Because this study is a phase I-II trial, these benefits should not be compared with those of any other reports. However, these results are encouraging and warrant further evaluation for survival benefit of this immunotherapy with an increased number of patients. Another interesting observation is that the increased number of IFN-γ-producing cells in PBMCs may be a biological marker for the prediction of clinical course in response to αGalCer-pulsed IL-2/GM-CSF-cultured PBMC administration. At present, a correlation between the induction of immune responses during various immunotherapy and the clinical outcome of treated patients remains controversial (35, 36, 37, 38). This dispute could be due to the variation of the quality of immunological assays among investigators, variable levels of tumor burden, and the different criteria used for measuring clinical responses by tumor immunotherapy. We established a very reproducible single-cell ELISPOT assay for the evaluation of immunological responses (31). Thus, although further analyses with an increased number of patients are required, the monitoring of PBMC IFN-γ-producing cells by ELISPOT would be an appropriate procedure for detecting NKT cell-dependent immune responses after the administration of αGalCer-pulsed IL-2/GM-CSF-cultured PBMCs. 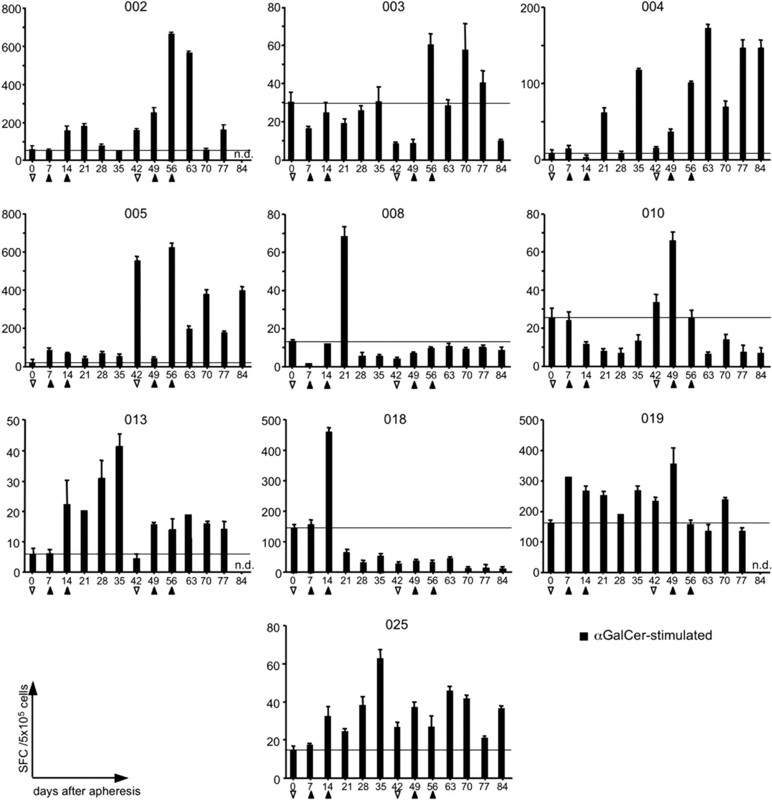 The relatively low expression levels of CD1d were detected (Fig. 2⇑ and Tables II⇑ and III⇑) on the IL-2/GM-CSF-cultured PBMCs, which appears to be the result of cultivation with GM-CSF (4, 39, 40). However, it is also reported that immature or mature DC, regardless of their expression levels of CD1d, were able to potently stimulate CD1-restricted invariant NKT cells (4, 39). Therefore the expression level of CD1d itself may not be so important for the efficiency in presenting αGalCer to activate NKT cells. The number of CD14+ cells was very low (mean, 0.97%), which may indicate that CD14+ monocytes in PBMCs successfully differentiated into DC. NKT cells in the peripheral blood were markedly increased but only once in all increased cases, and the expansion occurred during the first two injections in 5 of 6 cases (Fig. 3⇑). Vα24+Vβ11+ NKT cells appeared not to be expanded in in vitro cultivation with IL-2 and GM-CSF (Table II⇑ and Table IV⇑). Therefore, increased NKT cell numbers in the peripheral blood was unlikely to be a result of the adoptive transfer of in vitro expanded NKT cells, but rather due to the endogenous NKT cell expansion induced by αGalCer-pulsed IL-2/GM-CSF-cultured PBMCs. At this time, it is not clear why the marked expansion of NKT cells occurred only once. We have obtained no direct evidence indicating that anergy was induced in NKT cells. PBMCs produced sufficient IFN-γ in response to αGalCer stimulation even during or after the third or fourth injection in 8 cases (002, 003, 004, 005, 010, 013, 019, and 025) among 10 cases who showed an increased number of IFN-γ-producing cells (Fig. 5⇑). In addition, PBMCs obtained in the second apheresis appeared to expand normally in vitro when cultured with αGalCer and IL-2 for 1 or 2 wk (data not shown). Thus, NKT cells do not appear to be anergic during the second course of cell therapy. Moreover, the timing of IFN-γ production peak was unlikely to influence the survival benefit because some cases achieved maximal IFN-γ production during the first course and some attained it during the second course. In any event, from the prognostic point of view, the increased number of IFN-γ-producing cells but not the increased number of NKT cells was found to be correlated with the prolonged MST. None of the 17 lung cancer patients showed a major tumor regression. Immunotherapy that targeted on the NKT cell immune system has been undertaken at several institutes, and at present, there is no report of obvious tumor regression under the RECIST criteria after NKT cell immunotherapy including αGalCer-pulsed DC or in vitro-expanded NKT cell (25, 31, 41, 42). We have recently performed a phase I clinical trial of the administration of a small number of αGalCer-pulsed IL-2/GM-CSF-cultured PBMCs (1 × 108) in patients with advanced head and neck cancer (43). In this trial, αGalCer-pulsed IL-2/GM-CSF-cultured PBMCs were injected via the nasal submucosa. This route could offer an advantage for inducing the local immune responses more efficiently because the injected cells would quickly migrate to the ipsilateral regional lymph nodes (44). We detected lower but significant NKT cell immune responses in the PBMCs, suggesting the systemic induction of NKT cell-dependent responses even when a small number of αGalCer-pulsed IL-2/GM-CSF-cultured PBMCs were injected locally (43). Although confirmation is needed, we did observe one partial response case in this trial (43). The most important region to assess the antitumor immune responses in immunotherapy would be the tumor site. In the surgically resected specimens of lung cancer or colorectal cancer, the frequency of intratumor Vα24 NKT cells increased significantly (20), and the accumulation of Vα24 NKT cells in the region of colorectal cancer was related to a better survival (20, 45). Thus, a study focusing on the immunological analyses of the tumor site, including the assessment of NKT cell-dependent antitumor reactions at molecular levels would be of interest. In general, the immunotherapy may be more effective in patients with low tumor burden, and thus the most feasible application of this treatment would be the treatment of lung cancer patients with small tumor foci, including remaining micrometastases in the adjuvant setting after radical operation or following established first-line therapy. In summary, αGalCer-pulsed IL-2/GM-CSF-cultured PBMC immunotherapy, which induces the activation of endogenous NKT cells and NKT cell-dependent responses, was well tolerated. The increase in number of IFN-γ-producing cells in PBMCs were associated with prolonged MST, and thus this study encourages and warrants further evaluation of this immunotherapy for survival benefit. We are grateful to Dr. Ralph T. Kubo for helpful comments and constructive criticisms in the preparation of the manuscript. We thank Kirin Brewery for providing clinical grade αGalCer (KRN7000) for these experiments. We also thank all the nurses and staff surgeons in the Department of the Thoracic Surgery, Chiba University Hospital (Chiba, Japan) for excellent help with patient care and continuous support. ↵1 This work was supported in part by Global Centers of Excellence Program, Global Center for Education and Research in Immune System Regulation and Treatment, by grants from Japan’s Ministry of Education, Culture, Sports, Science and Technology (MEXT), and by Grant-in-aid 17016010 for Scientific Research of Priority Areas, Grant-in-Aid 17390139 for Scientific Research (B), Grant-in-Aid 19591609 for Scientific Research (C), Exploratory Research Grant 19659121, and the Cancer Translational Research Project. This work was also supported by the Ministry of Health, Labor and Welfare (Japan), The Japan Health Science Foundation, Yasuda Medical Foundation, Sagawa Foundation, and Kobayashi Institute for Innovative Cancer Chemotherapy. ↵3 Abbreviations used in this paper: αGalCer, α-galactosylceramide; DC, dendritic cell; NSCLC, non-small cell lung cancer; DVT, deep vein thrombosis; MST, median survival time. Taniguchi, M., M. Harada, S. Kojo, T. Nakayama, H. Wakao. 2003. The regulatory role of Vα14 NKT cells in innate and acquired immune response. Annu. Rev. Immunol. 21: 483-513. Godfrey, D. I., H. R. MacDonald, M. Kronenberg, M. J. Smyth, L. Van Kaer. 2004. NKT cells: what’s in a name?. Nat. Rev. Immunol. 4: 231-237. Spada, F. M., Y. Koezuka, S. A. Porcelli. 1998. CD1d-restricted recognition of synthetic glycolipid antigens by human natural killer T cells. J. Exp. Med. 188: 1529-1534. Brossay, L., M. Chioda, N. Burdin, Y. Koezuka, G. Casorati, P. Dellabona, M. Kronenberg. 1998. CD1d-mediated recognition of an α-galactosylceramide by natural killer T cells is highly conserved through mammalian evolution. J. Exp. Med. 188: 1521-1528. Kawano, T., T. Nakayama, N. Kamada, Y. Kaneko, M. Harada, N. Ogura, Y. Akutsu, S. Motohashi, T. Iizasa, H. Endo, et al 1999. Antitumor cytotoxicity mediated by ligand-activated human Vα24 NKT cells. Cancer Res. 59: 5102-5105. Seino, K., S. Motohashi, T. Fujisawa, T. Nakayama, M. Taniguchi. 2006. Natural killer T cell-mediated antitumor immune responses and their clinical applications. Cancer Sci. 97: 807-812. Nieda, M., A. Nicol, Y. Koezuka, A. Kikuchi, N. Lapteva, Y. Tanaka, K. Tokunaga, K. Suzuki, N. Kayagaki, H. Yagita, et al 2001. TRAIL expression by activated human CD4+ Vα24NKT cells induces in vitro and in vivo apoptosis of human acute myeloid leukemia cells. Blood 97: 2067-2074. Gumperz, J. E., S. Miyake, T. Yamamura, M. B. Brenner. 2002. Functionally distinct subsets of CD1d-restricted natural killer T cells revealed by CD1d tetramer staining. J. Exp. Med. 195: 625-636. Hayakawa, Y., K. Takeda, H. Yagita, M. J. Smyth, L. Van Kaer, K. Okumura, I. Saiki. 2002. IFN-γ-mediated inhibition of tumor angiogenesis by natural killer T-cell ligand, α-galactosylceramide. Blood 100: 1728-1733. Fujii, S., K. Shimizu, C. Smith, L. Bonifaz, R. M. Steinman. 2003. 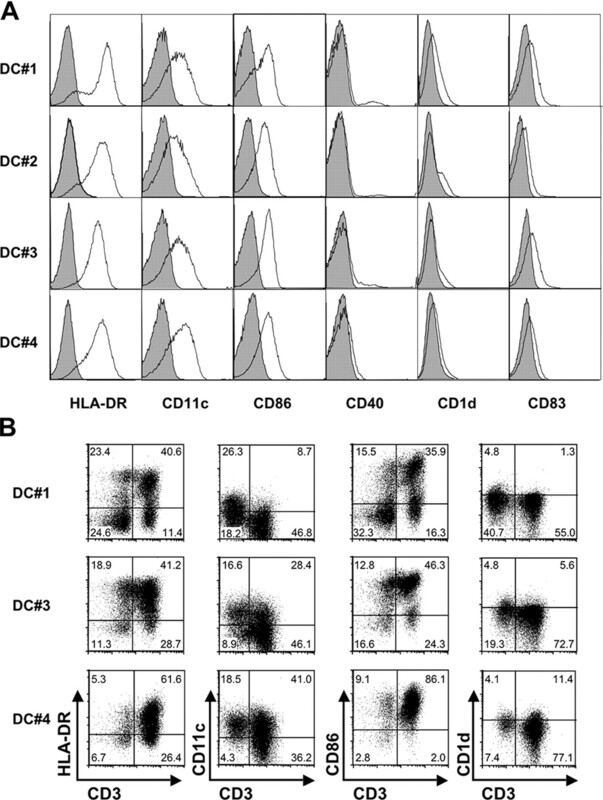 Activation of natural killer T cells by α-galactosylceramide rapidly induces the full maturation of dendritic cells in vivo and thereby acts as an adjuvant for combined CD4 and CD8 T cell immunity to a coadministered protein. J. Exp. Med. 198: 267-279. Smyth, M. J., N. Y. Crowe, D. G. Pellicci, K. Kyparissoudis, J. M. Kelly, K. Takeda, H. Yagita, D. I. Godfrey. 2002. Sequential production of interferon-γ by NK1.1+ T cells and natural killer cells is essential for the antimetastatic effect of α-galactosylceramide. Blood 99: 1259-1266. Taniguchi, M., K. Seino, T. Nakayama. 2003. The NKT cell system: bridging innate and acquired immunity. Nat. Immunol. 4: 1164-1165. Toura, I., T. Kawano, Y. Akutsu, T. Nakayama, T. Ochiai, M. Taniguchi. 1999. Cutting edge: inhibition of experimental tumor metastasis by dendritic cells pulsed with α-galactosylceramide. J. Immunol. 163: 2387-2391. Akutsu, Y., T. Nakayama, M. Harada, T. Kawano, S. Motohashi, E. Shimizu, T. Ito, N. Kamada, T. Saito, H. Matsubara, et al 2002. 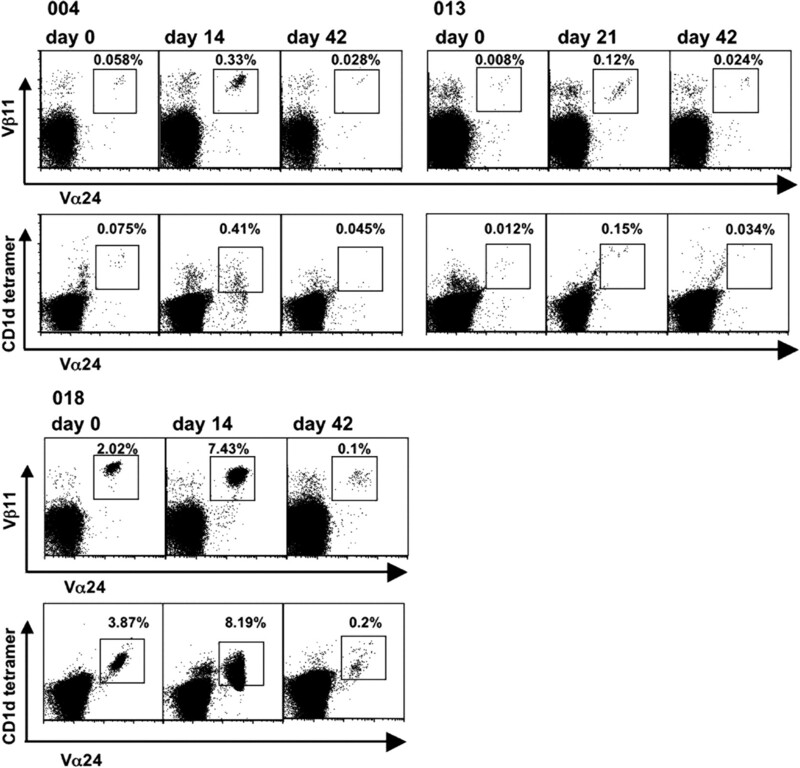 Expansion of lung Vα14 NKT cells by administration of α-galactosylceramide-pulsed dendritic cells. Jpn J. Cancer Res. 93: 397-403. Motohashi, S., S. Kobayashi, T. Ito, K. K. Magara, O. Mikuni, N. Kamada, T. Iizasa, T. Nakayama, T. Fujisawa, M. Taniguchi. 2002. Preserved IFN-γ production of circulating Vα24 NKT cells in primary lung cancer patients. Int. J. Cancer 102: 159-165. Schiller, J. H., D. Harrington, C. P. Belani, C. Langer, A. Sandler, J. Krook, J. Zhu, D. H. Johnson. 2002. Comparison of four chemotherapy regimens for advanced non-small-cell lung cancer. N. Engl. J. Med. 346: 92-98. Shepherd, F. A., J. Dancey, R. Ramlau, K. Mattson, R. Gralla, M. O'Rourke, N. Levitan, L. Gressot, M. Vincent, R. Burkes, et al 2000. Prospective randomized trial of docetaxel versus best supportive care in patients with non-small-cell lung cancer previously treated with platinum-based chemotherapy. J. Clin. Oncol. 18: 2095-2103. Spira, A., D. S. Ettinger. 2004. Multidisciplinary management of lung cancer. N. Engl. J. Med. 350: 379-392. Huisman, C., E. F. Smit, G. Giaccone, P. E. Postmus. 2000. Second-line chemotherapy in relapsing or refractory non-small-cell lung cancer: a review. J. Clin. Oncol. 18: 3722-3730. Ishikawa, E., S. Motohashi, A. Ishikawa, T. Ito, T. Uchida, T. Kaneko, Y. Tanaka, S. Horiguchi, Y. Okamoto, T. Fujisawa, et al 2005. Dendritic cell maturation by CD11c− T cells and Vα24+ natural killer T-cell activation by α-galactosylceramide. Int. J. Cancer 117: 265-273. Therasse, P., S. G. Arbuck, E. A. Eisenhauer, J. Wanders, R. S. Kaplan, L. Rubinstein, J. Verweij, M. Van Glabbeke, A. T. van Oosterom, M. C. Christian, S. G. Gwyther. 2000. New guidelines to evaluate the response to treatment in solid tumors. European Organization for Research and Treatment of Cancer, National Cancer Institute of the United States, National Cancer Institute of Canada. J. Natl. Cancer Inst. 92: 205-216. Leucocyte typing VII: white cell differentiation antigens. D. Mason, and P. Andrea, and A. Bensussan, et al eds. Proceedings of the Seventh International Workshop and Conference held in Harrogate, United Kingdom 2002 Oxford University Press, Oxford, U.K..
Gadola, S. D., N. Dulphy, M. Salio, V. Cerundolo. 2002. Vα24-JαQ-independent, CD1d-restricted recognition of α-galactosylceramide by human CD4+ and CD8αβ+ T lymphocytes. J. Immunol. 168: 5514-5520. Motohashi, S., A. Ishikawa, E. Ishikawa, M. Otsuji, T. Iizasa, H. Hanaoka, N. Shimizu, S. Horiguchi, Y. Okamoto, S. Fujii, et al 2006. A phase I study of in vitro expanded natural killer T cells in patients with advanced and recurrent non-small cell lung cancer. Clin. Cancer Res. 12: 6079-6086. Motohashi, S., T. Nakayama. 2008. Clinical applications of natural killer T cell-based immunotherapy for cancer. Cancer Sci. 99: 638-645. Mountain, C. F.. 1997. Revisions in the International System for Staging Lung Cancer. Chest 111: 1710-1717. Socinski, M. A.. 2003. The role of chemotherapy in the treatment of unresectable stage III and IV nonsmall cell lung cancer. Respir. Care Clin. No. Am. 9: 207-236. Bolonaki, I., A. Kotsakis, E. Papadimitraki, D. Aggouraki, G. Konsolakis, A. Vagia, C. Christophylakis, I. Nikoloudi, E. Magganas, A. Galanis, et al 2007. Vaccination of patients with advanced non-small-cell lung cancer with an optimized cryptic human telomerase reverse transcriptase peptide. J. Clin. Oncol. 25: 2727-2734. Mine, T., Y. Sato, M. Noguchi, T. Sasatomi, R. Gouhara, N. Tsuda, S. Tanaka, H. Shomura, K. Katagiri, T. Rikimaru, et al 2004. Humoral responses to peptides correlate with overall survival in advanced cancer patients vaccinated with peptides based on pre-existing, peptide-specific cellular responses. Clin. Cancer Res. 10: 929-937. Lonchay, C., P. van der Bruggen, T. Connerotte, T. Hanagiri, P. Coulie, D. Colau, S. Lucas, A. Van Pel, K. Thielemans, N. van Baren, T. Boon. 2004. Correlation between tumor regression and T cell responses in melanoma patients vaccinated with a MAGE antigen. Proc. Natl. Acad. Sci. USA 101: (Suppl 2):14631-14638. Hirschowitz, E. A., T. Foody, R. Kryscio, L. Dickson, J. Sturgill, J. Yannelli. 2004. Autologous dendritic cell vaccines for non-small-cell lung cancer. J. Clin. Oncol. 22: 2808-2815. Spada, F. M., F. Borriello, M. Sugita, G. F. Watts, Y. Koezuka, S. A. Porcelli. 2000. Low expression level but potent antigen presenting function of CD1d on monocyte lineage cells. Eur. J. Immunol. 30: 3468-3477. Exley, M., J. Garcia, S. B. Wilson, F. Spada, D. Gerdes, S. M. Tahir, K. T. Patton, R. S. Blumberg, S. Porcelli, A. Chott, S. P. Balk. 2000. CD1d structure and regulation on human thymocytes, peripheral blood T cells, B cells and monocytes. Immunology 100: 37-47. Uchida, T., S. Horiguchi, Y. Tanaka, H. Yamamoto, N. Kunii, S. Motohashi, M. Taniguchi, T. Nakayama, Y. Okamoto. 2008. Phase I study of α-galactosylceramide-pulsed antigen presenting cells administration to the nasal submucosa in unresectable or recurrent head and neck cancer. Cancer Immunol. Immunother. 57: 337-345. Horiguchi, S., T. Matsuoka, Y. Okamoto, D. Sakurai, K. Kobayashi, H. Chazono, T. Hanazawa, Y. Tanaka. 2007. Migration of tumor antigen-pulsed dendritic cells after mucosal administration in the human upper respiratory tract. J. Clin. Immunol. 27: 598-604.